The Association - FSG Bielefeld e. V.
The Familien-Sport-Gemeinschaft Bielefeld has about 250 members. The main interest is in popular recreational sports with the opportunity to participate in various sports activities as a single person or with the whole family. Modern sanitary facilities with hot showers, a caretaker, numerous activities during the cold weather season and two saunas make it possible to use our grounds in all seasons. Staying overnight is never an issue – we offer more than 100 sites for tent and caravan camping (including sewage disposal and electricity) for our members and guests (as a one-day-membership). Since sportsmanship and community is important to us, there are no fences or hedges in between the campsites. For our members and one-day-members to feel at home, we offer seasonal and local traditional food and beverages, non-alcoholic and alcoholic (Gastronomy). As a special service, there are pay-to-use washing machine and dryer. For our members and guests with physical limitations, we provide a handicap-friendly toilet and shower at the major sanitation facilities. You can access them via a ramp with your wheelchair or walking frame. Please ask anyone to help you using it, our members are happy to lend a hand! 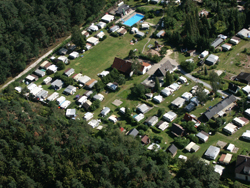 Our grounds are in the middle of the nature reserve Teutoburger Wald. For fire safety reasons, you may only use gas or electronic barbecues.